The famous Bostonian Speaker of the House, Tip O'Neill, once famously wrote, "All politics is local." The idea of this political principle is that for a politician to succeed, they must be able to meet their constituents' basic needs. To fail at meeting one's constituents' needs is to fail poltically. This is why the issue of protected bike lanes will be at the heart of a battle between the "locals" (Mayor Rahm and City Hall) and the "outsiders" (the Springfield-based Illinois Dept. of Transportation). Mayor Emanuel's Bike 2015 Plan for the city of Chicago and his ambitious goal of installing 100 miles of protected bike lanes. However, the Tribune has recently reported that IDOT, has decided to exercise its authority over state-designated routes that fall within its jurisdiction. A direct result of IDOT's intervention in the city's bike route planning is that any protected bike lane proposed for installation on a state-designated route will be stalled while IDOT compiles and analyzes data. Their stated justification is that the current statistical information available is insufficient to satisfy the state's safety requirements. With the IDOT superseding the Chicago Department of Transportation over these state-designated areas, plans for installing protected bike lanes--lanes that have actual physical barriers separating cyclists from motorists--may be compromised with outcomes that could fall short of expectations. For example, the strip of road on Jackson Street between Western Avenue and Ogden Avenue has a protected bike lane, complete with physical barriers, installed for cyclist use. However, the route between Ogden and Lake Shore Drive has only a buffered lane painted since that area falls under the State of Illinois's jurisdiction. The Illinois Bicycle Lawyers at Keating Law Offices have been firm supporters of the Mayor's ambitious plan to improve the city's infrastructure for not only its cyclists but for its motorists and pedestrians alike. 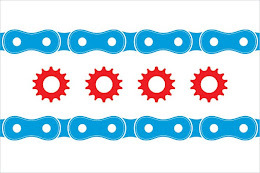 While news, like that mentioned in today's Tribune, may signal that progress may be stalled for the short-term future, we remain hopeful that the momentum for better cycling conditions will ultimately roll forward unhindered for Chicago. Tip O'Neill was right, all politics is local. And if the City of Chicago wants to move forward with the protected bike lanes, then Springfield shouldn't stand in the way. If you would like to help out and be a part of the conversation with the city's Bike 2015 Plan, you can contact the good people at Active Transportation Alliance and also keep up to date with the Mayor's Bicycle Advisory Meetings, listed at www.BikePlan2015.org.